Inasmuch as Barbara Brickner was, and is, the living embodiment of the Classical ideal--the most perfectly-proportioned model the fashion world has ever known--and possesses the face of an angel as well, it is easy overlook the fact that her posing abilities are as extraordinary as her beauty. Indeed, in the entire plus-size industry, perhaps only Valerie Lefkowitz can match her for the range of expressions, and the depth of emotion, that she infuses into her work, while all the time remaining utterly convincing, rather than theatrical. Barbara headlines both the Summer and Fall 2005 campaigns at Nordstrom, but because these campaigns feature clothing that is something of an acquired taste (paisley? ), it is worth taking this opportunity to look past her gorgeous figure for once (if this is possible), and to pay tribute to her modelling prowess. This exercise could prove inspiring to Barbara’s fans, and instructive to her modelling peers. We should stress that, in cropping these images, we mean no disrespect to Nordstrom. Quite the opposite. This company deserves limitless praise for the fact that it adheres to a size-14-or-better policy when booking plus-size models. The appeal of Nordstrom's clothing varies, but its casting practices are among the best in the industry. Barbara is well known for her life-affirming smile, but when she ventures into darker, more passionate territory, she truly distinguishes herself from other models. Here, dressed in an elegant gown, she expresses a confidence so commanding, that readers of this forum have referred to her bearing as "majestic." It is precisely this pairing of surpassing beauty, with a model’s discernible awareness of her own attractions, that artists have attempted to capture in their depictions of goddesses throughout the ages. Such a combination can have a profound impact on viewers, stirring emotions that they seldom experience in their prosaic, everyday lives. But perhaps even more fascinating is the following expression, which is rather more reflective. Indeed, this may be the most unique and original pose in this series. It suggests a passion lurking just underneath the surface, a desire that is present just beneath the model's regal demeanour. Note the heavily lidded eyes--an especially affecting touch. Next, we are treated to a dreamy, faraway look in which the passion is more apparent. Just try to imagine this expression in a different setting--with Barbara on a rocky promontory, gazing longingly off to sea, while the white surf crashes against the coastline, below. It is easy to imagine the model as the heroine of a historical saga, in which the noblest suitors compete to win her regard. This look is more in the style of the first, something that is calculated to have a direct effect on the viewer. This glance betrays a surpassing self-confidence, even a thrilling touch of haughtiness, and is akin to the captivating expressions for which Christina Schmidt is well known. But no model has ever quite duplicated the inward-looking glances which are Barbara's stock in trade. These may seem antithetical to the above image, with its alluring vanity, but they are every bit as compelling. With her eyes cast down, Barbara intimates a degree of modesty that seems unimaginable in conjunction with her astonishing beauty. But note the trace of a smile, as if she realizes that her apparently modest pose can only increase her fascination for the viewer. With slightly longer hair, Barbara's beauty becomes even more pronounced. In these two most recent images, from the Fall 2005 campaign, note how the youthful makeup adds an extra touch of liveliness to the images, working in contrast to the model's rather serious expressions. And as an aside, Barbara’s proficiency as a cosmetics model makes it astonishing that companies such as Maybelline do not regularly approach her, or her full-figured peers, to appear in their fantasy-rich advertising campaigns. For yet another unique look, we see Barbara adopting an expression that is gentle, indeed lyrical. It has a feeling of expectation about it, and--like so much of Barbara's work--suggests a narrative. The viewer wonders--what could have caught her attention? It that a hint of pleasure in her demeanour--or anticipation? And finally, it seems fitting that to close the series on one of Barbara's more familiar, sunnier expressions. The joy in her aspect is so contagious, that one's heart cannot fail to be gladdened by such a sight. To encounter beauty and delight in such measure lifts the viewer's spirits, and instils a feeling of hope, even in the darkest of times. The image also hints at the secret of Barbara's perpetual youth, that quality which keeps her so eternally vibrant. It is in the richness of her facial features, the fact that she has not allowed herself to starve, and has thereby avoided the gaunt, sunken-cheeked look that ravages so many models. Just like their straight-size rivals, when plus-size models drop dress sizes, their facial beauty is often ruined as a consequence. Soft fullness is nature's fountain of youth. Plus-size models are commonly asked to restrict their expressions to the kind of "happy, smiley" mien that customers appreciate. And the best models can make such expressions look just as fresh the hundredth time they adopt them, as the first. That makes it all the more delightful when a goddess is given the rare opportunity to convey a greater range of emotions, and to exhibit more of her posing talent. Bravo to Nordstrom for letting Mrs. Brickner treat her countless fans to such a fascinating display of her artistry--and her beauty. Barbara is more than just an inspiration to me. I really do consider her a role model, both in her personal achievements, and of couse in her beauty. I love the fact that she has never shrunk to fit any supposed trends, but has been true to herself and remained curvy- and gorgeous. There is just something about the dress, and her stance, and expression, that makes it perfect. Seeing Barbara at Talbots is somewhat bittersweet. On the other hand, it is always wonderful to see her on their site, but at the same time, it serves as a reminder that Talbots used to produce one of the industry's better plus-size catalogues, a magazine-size glossy affair that regularly featured countless image of Barbara, along with many other Mode alumni. How sad that, several seasons ago, the company reduced its plus representation to token landing-page appearances, while showcasing its plus apparel on straight-size models. It undoubtedly lost many customers, and any semblance of brand loyalty, in the process. Still, here is a lovely (if tiny) image of Barbara from the Talbots plus landing page, from Fall 2004. Note the classical balustrade in white marble, in the background. 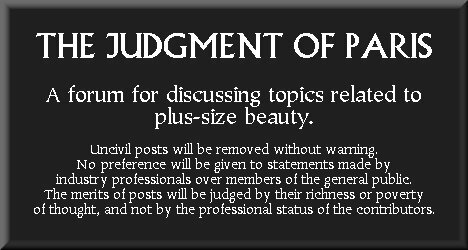 What a marvellous visual cue to underscore the association of plus-size beauty with Classical civilization. And as always, Barbara manages to create just the right look--a dramatic glance, a brush of the hair--to turn an ordinary outfit into something eye-catching. The original post mentioned that while Barbara's poses and expressions were artistic, the clothing wasn't as attractive as it might have been. But there is a new image at Nordstrom today that is quite stunning, and it's an outfit that I *really* like. Something about the very natural colour and texture of the fabric, and the way it frames Barbara's figure, makes it seem especially classical to me. And the hairstyle reminds me of the one Barbara wore in her recent Marc von Borstel test. This image has that unique "Greek sculpture brought to life" feeling that Barbara creates in some of her best images. Some of the newer models on this site are exciting because there's a certain feeling of surprise and expectancy about them. What will they do/create next? one wonders. But Barbara evokes that feeling too, even though she has already created so many amazing images in her career. You always know that no matter how incredible her past work has been, even better images could be coming the very next day- like this one, about which I can only say, WOW!